Non-Hodgkin’s Lymphoma arising primarily in adrenal gland is an extremely rare variant of extranodal lymphoma. The clinical presentation and the outcome vary depending upon the type of lymphoma and the extent of involvement of the adrenal gland. We report a case of Primary Adrenal Lymphoma (PAL) without adrenal insufficiency in a 62 year old female. The clinical and the routine laboratory evaluation were unremarkable. Serum lactate dehydrogenase was elevated. Computed Tomography of abdomen unveiled right sided heterogeneous adrenal mass extending from D10 vertebra to L2 vertebra. The diagnosis of primary adrenal lymphoma diffuse large B-cell (DLBCL) type was made on biopsy and immunohistochemistry. Primary malignant lymphoma in endocrine organs as extranodal presentation is rare, accounting for less than 8%. According to the literature review, primary adrenal lymphomas are seen usually in the elderly males and are frequently bilateral [1,2]. Pathologically, majority of cases are diffuse large B-cell lymphomas . About 50% to 70% patients have adrenal insufficiency . Prognosis of primary adrenal lymphoma is poor and majority of patients die within one year of diagnosis . Treatment of adrenal lymphoma is similar to that of other non-Hodgkin’s lymphoma which includes surgery, combination chemotherapy and or radiotherapy [4,5]. The case is presented due to its rarity and poor prognosis. A 62 year old female with unremarkable past and familial history presented to surgical department with abdominal pain of 2 months duration. The patient denied of having any bowel and bladder alteration. The vital parameters and physical examination at the time of admission was non-contributory. No lymphadenopathy, any skin pigmentations or organomegaly were evident on clinical evaluation. The routine investigatory protocol unmasked hemoglobin as 11.2 g/dl, total leucocyte count 7000/mm3, platelets 3,20,000/mm3. On biochemical and microbiological examination liver function tests, kidney function tests were within normal reference range and HIV was negative. Raised serum LDH level was noted (359 IU/L). X-ray chest, ECG were unremarkable. Ultrasonography (USG) abdomen disclosed a right suprarenal mass. Contrast enhanced computed tomography (CECT) abdomen and pelvis revealed 10.2 × 8.4 × 8.8 cm large heterogeneous mass involving the right suprarenal region (Figure 1a). Serum cortisol levels and urine vanillylmandelic acid (VMA) were normal. USG guided biopsy was carried out from the right adrenal mass. 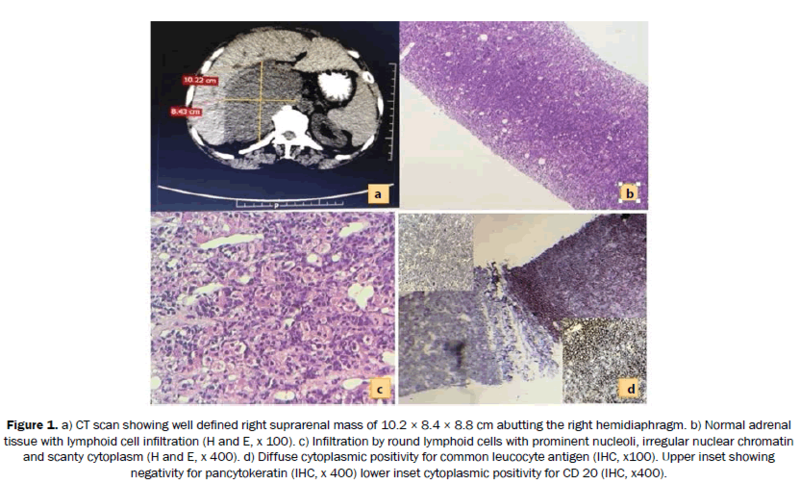 The histopathological examination showed diffuse infiltration of neoplastic lymphocytes into the adrenal tissue (Figure 1b). The tumour cells were large, round with prominent two to three nucleoli, irregular nuclear chromatin and scanty cytoplasm. Mitotic figures were noted (Figure 1c). On immunochemistry, the cancer cells showed diffuse cytoplasmic positivity for LCA (CD45), B-cell markers (CD20) and negativity for CD3, CD5 CD10, synaptophysin, chromogranin, CK, EMA and T-cell markers (Figure 1d). The diagnosis of Non-Hodgkin’s Lymphoma B-cell type of right adrenal gland was thus established. At present, patient is on cyclophosphamide, doxorubicin, vincristine and prednisolone based chemotherapy and on regular follow up. Figure 1: a) CT scan showing well defined right suprarenal mass of 10.2 × 8.4 × 8.8 cm abutting the right hemidiaphragm. b) Normal adrenal tissue with lymphoid cell infiltration (H and E, x 100). c) Infiltration by round lymphoid cells with prominent nucleoli, irregular nuclear chromatin and scanty cytoplasm (H and E, x 400). d) Diffuse cytoplasmic positivity for common leucocyte antigen (IHC, x100). Upper inset showing negativity for pancytokeratin (IHC, x 400) lower inset cytoplasmic positivity for CD 20 (IHC, x400). Adrenal lymphoma is defined as malignant neoplastic proliferation of lymphoid cells in the adrenal glands . Autopsy study made evident adrenal involvement in disseminated lymphoma in about 24% patients [7,8]. However, primary adrenal non-Hodgkin’s lymphoma is rare, it constitutes less than 1% of all non-Hodgkin’s lymphoma . It is important to differentiate between primary and secondary adrenal lymphomas, as both of them have extremely different clinical course. About 70%of primary adrenal lymphoma cases show bilateral involvement of adrenal gland and are usually associated with adrenal insufficiency [4-7]. Unilateral involvement of adrenal gland is manifested as abdominal pain and marked reduction in weight. The median maximum diameter of these tumors is 8 cm . It predominantly affects elderly males with male to female ratio of 2:1. Clinically, these patients present with constitutional symptoms like fever, local pain, weight loss, anorexia and symptoms of adrenal insufficiency. Adrenal insufficiency is not frequently seen because 90% of adrenal gland have to be destroyed before it becomes clinically evident. In our case, because of unilateral involvement cortisol levels were normal. Primary adrenal lymphoma should be considered in patients with elevated serum lactate dehydrogenase (LDH). In our case, serum LDH is elevated. The most common type of adrenal non-Hodgkin’s lymphoma is diffuse large B-cell type (80%) [7,8]. Using cDNA microarray diffuse large B-cell lymphoma (DLBCL) are prognostically divided into germinal center B-cell–like (GCB), activated B-cell–like (ABC), and type 3 gene expression proﬁles. On the basis of immunostains and gene expression studies DLBCL is classified as germinal center B-cell type and non-germinal center B-cell type [3,9] . A drenal DLBCL according to Ann Arbor staging is classified into early stage (stage IE, stage IIE) and advanced stage (stage IIIE, stage IV) . In our case, genetic profile could not be done. The most common hypothesis for origin of this tumour is haematopoietic tissue rests in adrenal gland [1,8]. Studies have shown that most of the patients are HIV positive and EBV positive. Our case was HIV negative. On immunopheno typing, these tumour usually express BCL-2 gene. BCL-6 gene rearrangement is the most frequently detected chromosomal translocation in diffuse large B-cell lymphomas with non-germinal center B-cell phenotype. The differential diagnosis included poorly differentiated adrenal cortical carcinoma, metastatic carcinoma and malignant pheochromocytoma. Thus, histopathology remains as the gold standard for definite diagnosis of adrenal tumours . Immunohistochemistry is required for evaluation of lymphoma. These tumours are considered lethal. Old age, large tumour size, initial presentation with primary adrenal insufficiency, elevated serum LDH, non-germinal center B-cell phenotype and involvement of other organs have poor prognosis . The treatment modalities for adrenal lymphoma include surgery, chemotherapy, radiotherapy or combination, corticosteroid replacement . The R-CHOP chemotherapy regimen is standard treatment for non- Hodgkin lymphoma . Primary adrenal lymphomas are frequently treated with cyclophosphamide, doxorubicin hydrochloride, vincristine and prednisolone (CHOP) or a CHOP-like regimen. However, the prognosis is generally poor with range of survival from 3 days to 26 months . Recently rituximab has been added to the regimen with reports of good outcome for PAL as it prolongs survival and helps in complete remission . However CNS relapses occur frequently in about 2.2% to 5% cases of aggressive non Hodgkin’s lymphoma . Thus, rituximab containing chemotherapy regimen combined with CNS prophylaxis is a reasonable option for treatment of primary adrenal lymphomas . Other chemotherapeutic regimens include CVP (cyclophosphamide, vincristine, and prednisone), and MACOP-B (adding methotrexate and bleomycin) . Primary adrenal lymphoma is extremely rare and majority of the cases are diffuse large B-cell type. The prognosis of PAL depends on extent of involvement of the organ. It is thus important to differentiate between primary and secondary adrenal lymphomas because of variable clinical course. Dutta P, et al. Primary Adrenal Lymphoma. The Endocrinologist. 2005;15:340-342. Mozos A, et al. Most primary adrenal lymphomas are diffuse large B-cell lymphomas with non-germinal center B-cell phenotype, BCL6 gene rearrangement and poor prognosis. Modern Pathol. 2009;22:1210-1217. Ichikawa S, et al. Clinicopathological analysis of primary adrenal diffuse large B-cell lymphoma:effectiveness of rituximab-containing chemotherapy including central nervous system prophylaxis. ExpHematolOncol. 2013;2:19. Khurana A, et al. Primary non-hodgkin’s lymphoma of left adrenal gland – a rare presentation. JClinDiagn Res 2015;9:XD01-XD03. Kim KM, et al. A case of primary adrenal diffuse large b-cell lymphoma achieving complete remission with rituximab-chop chemotherapy. J Korean Med Sci. 2009;24:525-528. Ho CH, et al. Primary adrenal lymphoma - a rare entity with grave prognosis. JTUA. 2009;20(4):168-172. Aziz SA, et al. Primary adrenal lymphoma: Differential involvement with varying adrenal function. Indian J EndocrMetab. 2011;15:220-223. Yoon JH, et al. A Case of primary adrenal lymphoma. Korean J InternMed. 2003;18:122-124. Hans CP, et al. Confirmation of the molecular classification of diffuse large B-cell lymphoma by immunohistochemistry using a tissue microarray. Blood. 2004;103:275-282. Kim YR, et al. Prognostic factors in primary diffuse large B-cell lymphoma of adrenal gland treated with rituximab-CHOP chemotherapy from the Consortium for Improving Survival of Lymphoma (CISL). J HematolOncol. 2012;5:49.